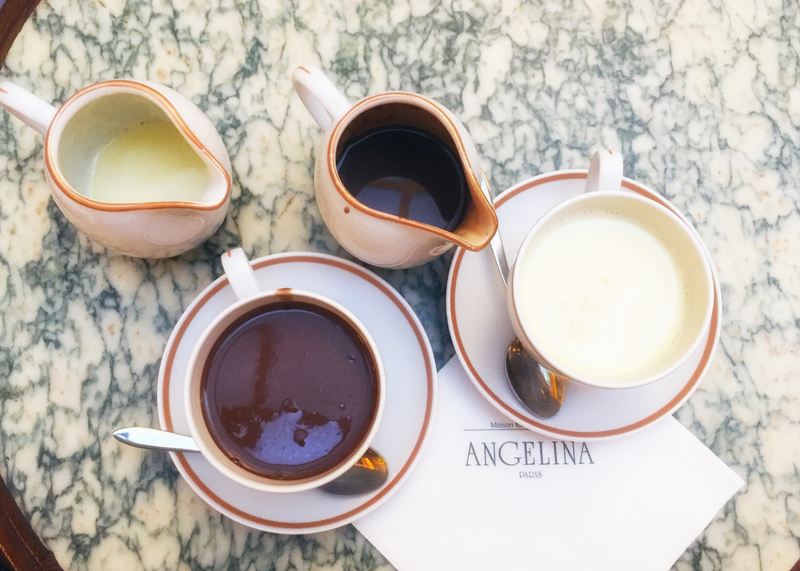 On top of our list of places was, of course, the world-famous hot chocolate of Angelina’s. It deserves its place way up there. The chocolate is rich and thick and the decor is what you would expect, if a little crowded with tourists (even in February). What caught my son’s attention and palate was the white hot chocolate. A number one for him. You need to try it if you’re into white chocolate. In addition to their traditional hot chocolate (that comes in many variation) they offer a lot more, but you need to discover for yourself. The location rue de Rivoli in the 1st arrondissement is perfect if you feel like walking between the Louvre and the Place the la Concorde. If you feel lazy, you can simply walk to their location inside the Louvre, or inside the Chateau de Versailles if you are touring the sites. If worse comes to worse, you can also sample the chocolate at the airport on your way out. 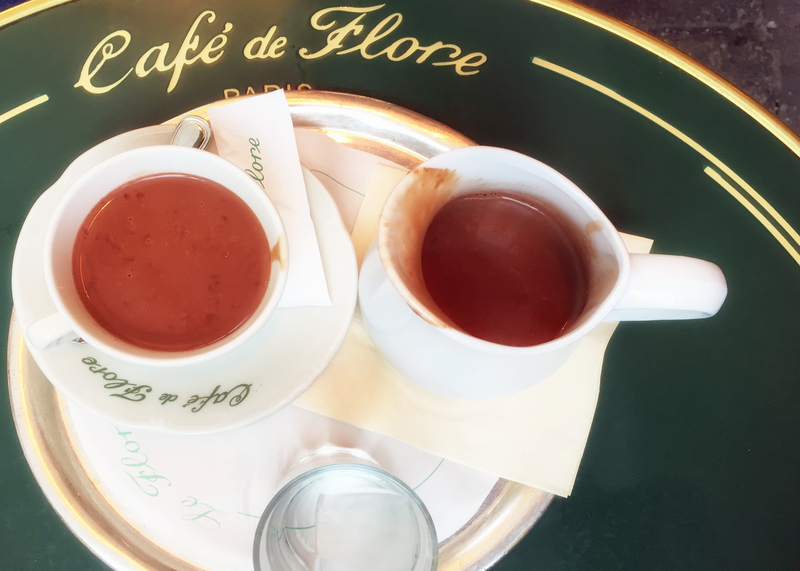 Known for its hot chocolate, the Cafe de Flore is also famous for its renowned patrons over the years. Jean Paul Sartre and Simone de Beauvoir spent their entire days there: working, talking, eating with friends and reinventing the world. Today you might catch a glimpse of a hollywood celebrity as you sip your warm drink and enjoy the first rays of sunshine of the spring season from the terrace Boulevard Saint Germain. The chocolate is thick and creamy, almost syrupy. High marks! Chez Paul Boulangerie, as its name indicate, is a bakery and restaurant chain with several addresses in Paris (and in over 30 countries), with a light hot chocolate. If the chocolate from Angelina or Le Flore is too thick for your taste you will like the one served as Chez Paul. You may also enjoy the delicious breads they make such as the “Fougasse aux olives” an olive bread close to the Italian focaccia (very popular in Provence). We gave this restaurant the highest ranking. Creamy but not heavy, the chocolate is perfectly balanced for our taste. Located in one of the charming covered passages scattered around Paris, Cour du Commerce Saint André in the 6th arrondissement, close to the Place de l’Odéon, the tea or chocolate room is the brainchild of Paul Cluizel, the famous chocolatie: a place for chocolate lovers and connoisseurs. Un Dimanche à Paris is a chocolate store, a chocolate bar and lounge as well as a restaurant. It’s also a place that hosts chocolate tastings, baking classes (revolving around chocolate, of course) and other chocolate-related event. We loved the old fashion cholocatière pot with its wooden stirrer and handle. In another charming little passage in the 6th arrondissement, the Passage Dauphine, l’Heure Gourmande offers a nice selection of pastries but also savoury dishes if you walk in around lunch time. They also have a good brunch. Sitting outside if the weather is nice, gives you a feeling of countryside, but in the dead of winter, it’s happening inside. Their hot chocolate is good but watch out for the bitterness; it’s melted dark chocolate and milk, nothing else is added. On the right bank and for another vibe, Loustic is a hoping coffee shop close to the Musée des Arts et Métiers in the 3rd arrondissement. More of an expresso experience with an astonishing selection of coffees, they serve a really sweet and light hot chocolate. You can please the whole family here. It’s such a cool atmosphere that patrons hang out with their laptop for hours. In a more traditional style, you won’t be surprised to hear that Ladurée offers a thick and creamy chocolate in addition to its world-famous macarons. A perfect spot for an afternoon snack. The tea room has been a classic place for afternoon tea for more than 150 years and has expanded over time across the borders (all the way to Hong Kong).